Even if you are not a fan of the “Game of Thrones” series, that statement may be enough to strike terror into your heart. But with foresight and preparation you should have nothing to fear from the coming cold season. Especially if you take the time now to prepare your home’s heating system so that it will work properly and efficiently when you need it most. Here are five steps to take to make sure you’ll be cozy and warm when temperatures drop. Schedule a pre-season system tune-up. A professional tune-up by one of Alvin Hollis’ expert heating technicians is the best way to ensure your home heating system is ready for winter. 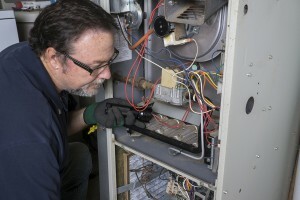 We cover an extensive checklist that includes changing the air filter, checking the thermostat, vents, lubricating moving parts, tightening electrical connections and checking air ducts for leaks. Change your air filter. Many of the heating system tune-ups we perform include the relatively simple step of changing the heating system’s air filter. A dirty filter can force your system to work harder, and could even cause a system shutdown requiring and emergency service call. For boiler-equipped homes we clean out dust and dirt, check the damper and exhaust fan for proper function, inspect the firebox and heat exchanger, and drain sediment from the boiler. Clear outside exhaust vents and chimneys. While the weather is still favorable you should make sure chimneys and vents are not blocked. This is one of the first things we do when performing pre-season maintenance for our customers, as a blocked chimney or vent can cause dangerous carbon monoxide to back up into your home. Lower your thermostat. Turning the room temperature down just a couple of degrees during cold weather can provide a little relief of the pressure on your heating system. If you have a multiple zone system, turn down the thermostats in rooms that are seldom used. Another option is installing a Mitsubishi ductless heating & cooling unit in the rooms you use most frequently, which gives you more control over which areas you want to keep warm while reducing oil or gas use. Close vents in unused rooms. Many heating systems include vents in areas like attics, basements and crawl spaces that are seldom used. Closing these vents will help keep warm air circulating where you need it most. Just be sure to keep heating vents open in areas where exposed pipes are located, to help prevent freezing. You can schedule a pre-season tune-up by calling us at (781) 335-2100. The best time to get this work done is right now, before temperatures start to fall.